Visible migration in 2010, in the end proved to be quite exceptional. The Autumn period was especially productive and provided the highest monthly totas for quite a number of species. Mid January also saw some return movement after the thaw of snow and the Spring was notable for it's raptors and the shortness of the migration period this year. Following snow early in the year, there was some notable Sky Lark passage, as birds moved through the area with the return of milder weather. A total of 179 Sky Lark west and north-west on January 17th, was made up of mostly two's and three's but two flocks of 19 and 26 also went through. A few birds also flew south, but there was obviously a great deal of movement for this early date, with 194 Wood Pigeon north-west, 22 Yellowhammer west (including groups of nine and ten) nine Linnet west and a Tree Sparrow south the same morning. The following day also saw a further 50 Sky Lark going west and clearly associated with this Sky Lark movement, was a Lapland Bunting that went low north-east over Eakring Flash on January 20th. Spring was hardly remarkable, but notable for the first Osprey for several years and three Marsh Harriers. There was a record count of Whimbrel in early May, but hirundines and Meadow Pipits all returned poor monthly counts. The Spring migration this year, has been about the shortest I can remember, with the general feeling being of late June, rather than late May. With several Common Buzzards residing in the recording area for the whole of the year now, the determination of genuine passage birds, tends to rely on plumage differences, primary and secondary feather wear or behaviour. Certainly, passage birds were evident on April 3rd and 8th, whilst May 1st produced a group of five north, followed soon after by a group of three and then two single birds. The personal highlight of the whole of the Spring, was provided by superb views of an Osprey that arrived at Eakring Flash low from the south-east and then left low north-west after five minutes on April 4th and was one of just a handful of migrants seen the whole morning. 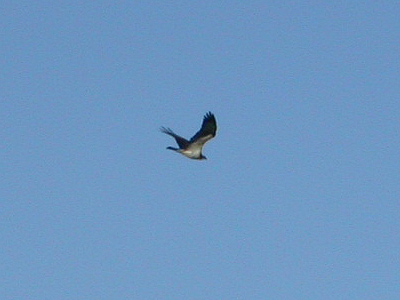 It was the first Osprey here since 2005 and had presumably roosted nearby overnight. April also provided two Marsh Harrier, with a female low south-west over Lound Wood and Eakring Flash on April 11th, then another female Marsh Harrier at Eakring Flash, before it drifted off east on April 30th. A third Marsh Harrier (an immature male) flew north over Eakring Flash on May 3rd and a Red Kite was seen on several dates between May 20th and 26th. Four migrant Sparrowhawk went through in April, including three north-west together on 15th. 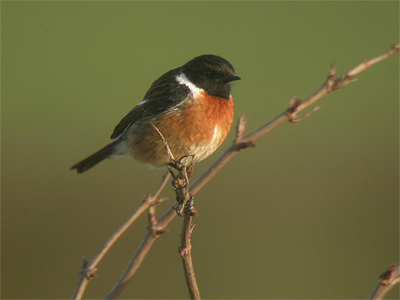 A male Stonechat at Eakring Flash on March 21st, was quite a dark and striking bird, showing some white on the rump and was possibly of continental origin, although not as obvious as the rubicola bird of April 23rd 2008. Three Whinchat in a single Spring is now a very rare event here, but after the first at Eakring Flash on April 21st, further records came on April 30th and May 1st. The arrival of a Whinchat and other migrants into the area on April 21st, took place when visually, nothing moved through apart from four Swallow, four Sand Martin, four Yellow Wagtail and little else. It was quite surprising that a male Wheatear turned up at Eakring Flash, was followed shortly after by the very flighty female Whinchat (earliest ever site record) Both birds soon disappeared, but moving to Tug Bridge Farm provided three male and a female Wheatear in the bare roadside field and a female Redstart across the road next to the farm. Another female Redstart was located in the Hawthorns at Penny Pasture Common on what ended a good day for chats and a Greenland Wheatear briefly at Eakring Flash on April 24th, completed a relatively good showing. It was a poor Spring for wader records, but classic conditions on May 8th suddenly produced a flock of 28 Whimbrel, high north-east over Eakring Flash at 08:26h, with the flock just below the cloud base. A quick phone call at the time, proved that there was an impressive movement of Whimbrel at (or over) many Midlands waters this particular morning. The same morning also produced an Oystercatcher moving north-west, with one flying west over Eakring Flash on the earlier date of April 26th. The only other Spring wader, was a Curlew high north on April 1st. Visible migration proved poor and the general feeling at the end of May, was that this was a very short Spring and pretty much all over by mid-May. At the end of May, I remember commenting at the time, that it had the feeling of late June, rather than late May. Meadow Pipits peaked at a very poor 72 north-west of March 28th and Sand Martin at 16 north-west on April 8th. There was a small but steady trickle of Swallows, but little purposeful movement. Counts of 27 generally north-east and north-west on April 19th, 30 on April 25th and 38 north-west on April 29th, were the best on offer. Nine Jay in April (most throughout the last week) was an excellent Spring total, but one of the most interesting observations was a tight group of three male Blackcap together at Eakring Flash, that all left north together on April 28th. In a complete contrast to the Spring, Autumn went on to provide the best period of migration seen at Eakring for many years. Numerous species produced their best ever monthly counts, with October being particularly exceptional in terms of numbers and quality. Much of the late Summer and early Autumn period was missed, but the site visits that were made, gave no indication of what was to come a few weeks later. Excellent monthly counts were reached by Redwing and Fieldfare, with records numbers of Chaffinch, Brambling, Yellowhammer and several others. Starlings trickled through, but began to move through later in October, before they peaked at 1 739 west on November 7th and Wood Pigeon at 1 038 south on November 6th. Starlings were held up on the continent by poor weather, yet it was the same weather system, that allowed the perfect conditions for birds to leave Scandinavia. With strong north-easterlies for much of the period. Redwings were the first to arrive in numbers, but came in exceptionally high and were easily missed. The north-easterlies also brought plenty of low cloud, which certainly affected some parts of the UK more than others, being almost fog and greatly reducing visibility. Coinciding during mid-week also meant that many of the usual observers were unable to get out and so missed the event. The first Redwing to arrive were three moving north on October 7th and suddenly 736 went south over Eakring Flash on the 9th. The next day saw Redwing flocks pouring through very high south again till 11:00h, when all movement stopped, but by then, a total of 2 401 had been reached. This movement seems to have been north/south down the UK, with sites either side of the Pennines not getting any or just small numbers. The southerly movement was also very unusual and only noted here before during cold weather movements. 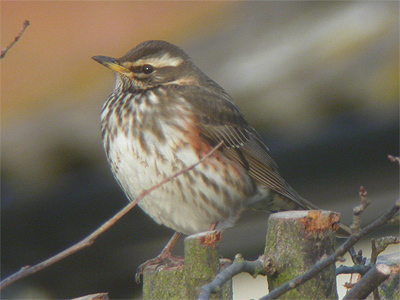 Some Redwing flocks contained other species, such as Fieldfare, Brambling and Pied Wagtail, but October 10th was also notable for a record total of 45 Song Thrush south. 25 Song Thrush flew through high in various directions on 12th and was another excellent morning's total on 12th. By the end of October, a total of 125 migrant Song Thrush had been recorded. 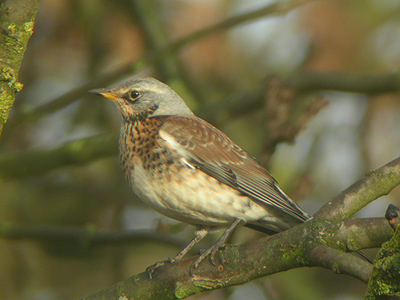 Fieldfare arrived later than Redwing, with the first being 21 west on October 10th, with the peak coming later in the month with 1 194 west (21st) and 2 821 west (24th) Associated with this arrival of Scandinavian Thrushes was a 1st Winter female Ring Ouzel, which was located by call, but then gave only brief views in the Hawthorn and Blackthorn thicket dividing Penny Pasture Common from the rest of the Eakring Meadows NR on October 13th. Two other species to break all previous monthly totals were Chaffinch and Brambling. One bird short of 1 100 Chaffinches were recorded, with a peak of 148 south and west on October 5th. A monthly total of 278 Brambling finally ended their visible migration drought at Eakring and birds were recorded on most days throughout October, but best of the month's counts included 38 through October 11th, 44 low south-west October 23rd (including a flock of 43 birds) and another 44 Brambling through on October 24th. Sky Lark also produced a new record monthly count during October, whilst some very good sized flocks built up in at least two sites within the area. Best of the Sky Lark counts were 65 west and south-east (2nd) 154 south-east on (4th) 79 south (7th) and 51 south-west on 14th, the same day that a flock on Red Hill numbered approximately 93 birds. The Red Hill/Eakring Flash Sky Lark flock also included high numbers of Yellowhammer, eventually reaching a total of 136 at it's peak at Eakring Flash on the 9th. Yellowhammer were also noted moving south-west for much of the month, again producing a record 177 October total. Meadow Pipit and Pied Wagtail migration peaked at 417 south-east and 53 south and south-east respectively on October 7th, part of a monthly total of 222 Pied Wagtail. Rarities noted during the course of Octobers coverage included a single Wood Lark north-east over Eakring Flash on 4th, three Waxwing west (28th) and a Rock Pipit high west (8th) Two Lapland Bunting went south over Red Hill at 10:25h on 2nd, both birds giving good views as they flew past at not that great a height. With Lapland Buntings moving over one Pennine watchpoint on an almost daily basis during October, it was not enitrely surprising that a third Lapland Bunting appeared, calling several times as it approached from the north-west and eventually continuing south-east on the 12th. It was not all about the arrival of Winter migrants, as many Summer migrants continued to be noted throughout the first half of October. The best of these, was the 1st Winter male Redstart present in the Hawthorns at Red Hill from 4-7th. Swallows produced some decent late counts, with 66 south and south-east (2nd) 67 south-east (4th) 91 south (6th) before the last of the year on 17th. Four Chiffchaff in the area on the 7th, was the highest count of the month. Raptor highlights had to be the ringtail Hen Harrier that went high south-east over Eakring Flash on the 10th, but there was an unprecedented passage of four Merlin recorded, with an immature male (5th), two separate males moving south-east at 09:35h and 10:25h on 10th, before another adult male hunting Sky Lark briefly, before continuing south-east on 16th.